A.G Gani Patail not sure of witnesses but abuses power by racial prosecution and fixing hearing date to fix up and jail Hindraf Secretary P. Ramesh for 3 years. 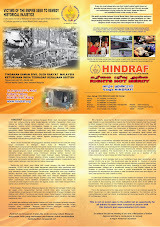 This morning 11/4/2011 at 9.15 a.m P. Ramesh again had to appear on his second Hindraf racist prosecution at K.L also for having with him Hindraf Makkal Sakthi banners and posters with the first being in Ipoh also for the same offence being a member of Hindraf, a human and minority rights NGO. The racist UMNO Attorney General Gani Patail sent his Indian mandore DPP P. Vickneswaran to do the mandorist job to move attention away from the racist UMNO AG and the UMNO regime and to create an Indian vs Indian fight as what UMNO had been doing in the last 54 years. Lawyer for P. Ramesh, Mr. P. Uthayakumar asked for the list of the prosecution’s List of Witnesses but the Indian DPP mandore said the AG does not have to furnish the same. P. Uthayakumar retorted in open court that this was the classical case of the Attorney General’s abuse of powers. Uthayakumar asked how the Attorney General can even prosecute when the A.G is not even ready with the List of Witnesses. Uthayakumar told the DPP to convey to the A.G not to abuse his powers., and took the opportunity to bring to the attention of K.L Magistrate Mohd Azali bin Ibrahim that the Hindraf Secretary should not be in the dock in the first place. But despite this the 98% UMNO Malay muslim dominated Magistrates Court and Judiciary fixed for trial the 27th and 28th July 2011 as the Hearing date of this racially profiled, politically motivated and malicious prosecution by the racist bully UMNO AG on the UMNO top leadership orders to stop Hindraf Makkal Sakthi and HRP, to stop us from championing the plight of the Indian poor . But Hindraf’s and HRP’s Rights not Mercy struggle will continue irrespective of the 3 years jail. A CLASSIFIED advertisement for the rental of a high-end condominium in Kuala Lumpur appallingly asserts NO INDIANS — throwing up a regrettable case of selective bias. It was the first time in local English media that I had come across a downright racist advertisement that steered prospective Indian tenants away. It was not meant for Indian nationals — it applied to any Indian, including me. I may be accused of overstepping racial lines but the advertisement in a national daily by a Malaysian Chinese lady working and living in Sydney, Australia, takes Indian bashing here to new depths of shame. The advertisement by the owner, a radiologist, for rental of her apartment suite at Bistari condominium near the PWTC and The Mall explicitly states “No Indians”, something so bold and blunt unseen in the housing ads of newspapers. Her problem with Indians: curry! She would not have her tenant cooking up a "toxic" cloud of curry fumes that permeates the entire 1,500 sq ft suite. I asked her property agent: “Are Indians the only ones who cook curry?” “Are Indians the only ones who enjoy curry?" Asked if the advertisement that specified "No Indians" was prejudiced, she said it was a condition by the owner that would be in the tenancy agreement. There is, however, no legal position on people stirring overpowering and lingering whiffs in apartments. Real estate negotiators and lawyers tell me there is nothing in a contract that can get a tenant evicted for cooking curry. Clearly, in this case Indians are being treated less favourably than other tenants when we know housing discrimination is unlawful and unacceptable. If you don’t want an Indian tenant, you don’t have to broadcast it to the whole world. Deal with it privately and sensibly instead of indulging in racial steering. It’s beyond me why the newspaper published the discriminatory “No Indians” condition when it monitors ads for other reasons, such as obscenity and deceptive advertising. It cannot argue that monitoring for discriminatory messages was a burden as the practice of racial steering is provocative and bears serious social ramifications. The right thing to do would be to pass on to regulatory authorities the details of those individuals who post discriminatory ads that excluded prospective tenants on the basis of race, gender, family status, marital status, national origin, and religion. To evaluate owner-sentiment toward Indian tenants, a Being Frank enquiry was launched over the weekend with visits to six high-end apartment suites in various parts of Kuala Lumpur and Petaling Jaya. I was the prospective tenant, with "four children" and in all cases, the owners found me, meaning an Indian, a liability: ● One told the agent, who accompanied me, Indians make too much noise and create a mess. However, when I offered him RM300 extra a month for the RM2,100 apartment, he accepted. ● Another said Indians were known to be quarrelsome “so that won't work out”. ● Three of them said four kids were too many, so “No children”. ● One asked me what car I drove and wanted a letter from my company stating my position and a copy of the monthly pay slip. He obviously didn’t trust this Indian. The owners of two other apartments I was scheduled to see told their agents not to show the units to Indians. Their contention: Indians are messy, too loud and do not give the apartment complex a good image. I was astonished and can conclude that fair and equal access to housing is not a cornerstone of our society. Equal access to housing in Malaysia is a fundamental right and this nation should not tolerate discrimination in housing. Few things are more fundamental to success and happiness than having a safe place to live. The government should actively pursue these concerns with the goal of fairness and equity for all. Admittedly, there are differences in our culture and social practices but such blatant profiling of any ethnicity is destructive to society. It’s just pure pomposity — conceit that causes human relationships to be lost, self-righteousness that causes the trust to be lost too. There may be good reasons for excluding certain troublesome types or undesirables, but whole scale social exclusion is divisive and is the thin end of a more sinister mindset. Let us treat this responsibility as an opportunity. A chance to take stock, to ask ourselves: how did it come to this? Is it a material, genetic or self-inflicted deficiency that has led one to ignore co-existing in harmony? The first step to rehabilitation is to recognise you have a problem. FRANKIE D'CRUZ is editor-at-large of The Malay Mail. The multiple award-winning journalist can be contacted at frankie@mmail.com.my. NGOs submit memo urging the PM to resolve illegal immigrant woes in Sabah and recognise indigenous people's rights over NCR land. KUALA LUMPUR: Six NGOs representing minorities groups in the nation handed over a memorandum to the government in a bid to compel the government to address their plight. Among the signatories were Borneo Resources Institute (Brimas), Common Interest Group of Malaysia (CigMa), Hindraf Makkal Sakthi, Indigenous People’s Network of Peninsular Malaysia, Sarawak Dayak-Iban Association (Sadia) and Sarawak Dayak National Union. “We had a conference on the marginalisation of minorities in Malaysia earlier this year. We drafted a memo and submitted it to the government. Hopefully, the government will look into the issues,” said Hindraf advisor N Ganesan at a press conference today. The memorandum was addressed to Prime Minister Najib Tun Razak and was submitted to his department in Putrajaya this morning. Also present during the press conference were Cigma president Daniel John Jambun and Indigenous People’s Network of Malaysia’s Yusri Yahut. Ganesan said that NGOs were now coming together as a collective unit and there was a better prospect of having their voices heard with the larger representation. “We are expanding our network to include other minority groups for strength in numbers. It is gaining momentum and hopefully it can create changes for the marginalised,” said Ganesan. Daniel John said his NGO highlighted a very important issue plaguing the people of Sabah, which is the influx of a large number of illegal immigrants. “Sabahans demand the government institute a Royal Commission of Inquiry (RCI) to investigate allegations that illegal immigrants in the state are being given MyKad indiscriminately. “We want justice.We also want the names of those illegals issued MyKads deleted from the electoral list before the general election and brought to book,” said Daniel. Yusri called on the government to respect indigenous people as the original inhabitants of the land. “We want the government to respect our history and recognise the customary rights of the indigenous people to their lands. “In addition, we want the government to return land confiscated from the indigenous people or provide adequate compensation for their losses,” he said.